After his last appearance four years ago, Maestro Riccardo Frizza is returning to the Bay Area for his fourth collaboration with the SF Opera. This season he will be conducting Donizetti’s iconic Roberto Devereux, from September 8th to the 27th, 2018. His previous productions include Lucrezia Borgia in 2011, I Capuleti e i Montecchi in 2012, and Tosca in 2014. We are thrilled to welcome him back to San Francisco to share his talents once again! 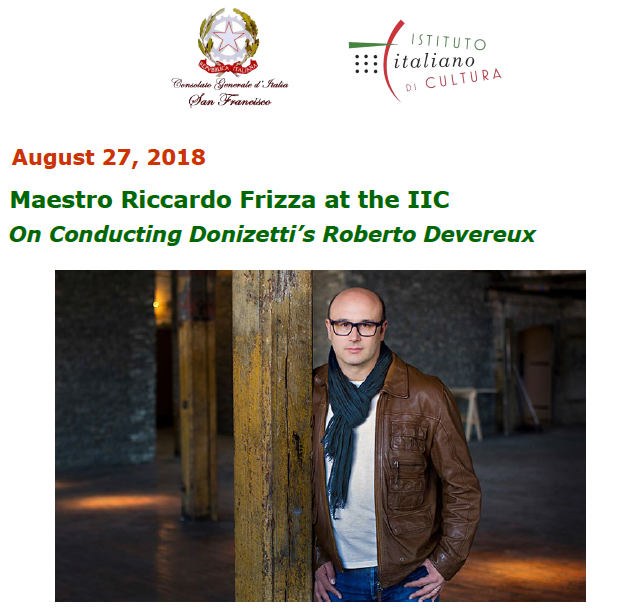 Fortunately for us, Maestro Frizza will come to the Institute on August 27th to give a presentation on Donizetti’s opera. He will also be sharing his passion for culinary art. Come by for an insider’s look at the opera before the Maestro takes the baton on September 8, followed by performances on September 11, 14, 18, 23, and 27, 2018. Award-winning Italian Maestro Riccardo Frizza is a galvanic presence on the podium, inspiring performances as exhilarating as they are expressive. Championed by Alberto Zedda, Bruno Cagli, and Gian Carlo Menotti, he is a leading exponent of bel canto reper-toire, collaborating with a who’s who of today’s most iconic singers at opera houses from Milan’s Teatro alla Scala to the Metropolitan Opera in New York. In the concert hall, he graces the podiums of such world-class ensembles as the Leipzig Gewandhaus, Rome’s Orchestra dell’Accademia Nazionale di Santa Cecilia, London’s Philharmonia Orchestra, and the Tokyo Symphony, while his extensive discography includes Decca’s Una furtiva lagrima, winner of the 2004 Cannes Classical Award.